New complete rebuild kit for YAMAHA YZ 125, Each kit contains everything you need to complete your rebuild the right way, the first time- crankshaft and connecting rod (fully assembled), piston, crankshaft bearings, and complete gasket & seal kit made to meet or exceed OEM. Oversize pistons are not available with this kit. Factory assembled and trued to within. 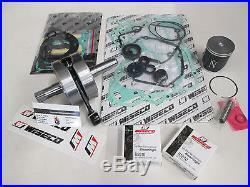 The item "YAMAHA YZ 125 ENGINE REBUILD KIT CRANKSHAFT, PISTON, GASKETS 2001-2004" is in sale since Thursday, April 25, 2013. This item is in the category "eBay Motors\Parts & Accessories\Motorcycle Parts\Engines & Engine Parts\Other Engines & Engine Parts".